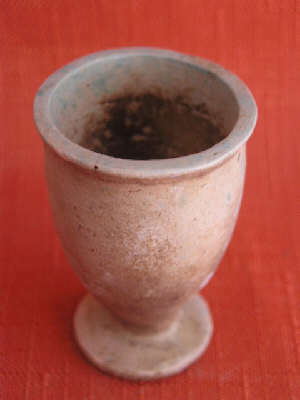 Rare ancient egyptian Blue Faience Votive vessel/Cup With Hieroglyphics. What a neat item for that Ancient Worlds lover. 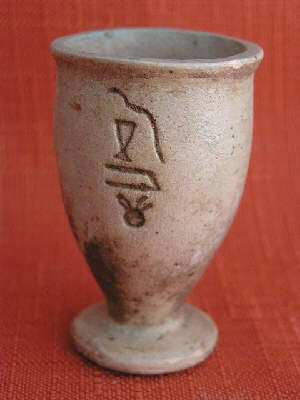 This is a wonderful Litte Ancient Egyptian Faience cup with a light blue glaze.This marvelous piece has a hieroglyphic inscription on the front and appears to be in excellent condition with a tiny chip in the lip of the cup. 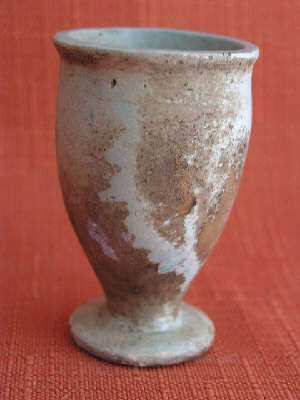 Due to the small size of this object it is most surely made to be a Votive or Offering cup. This is a truly rare and wonderful find and appears to date Third Intermediate Period ( 945-715 Third Intermediate Period Dynasties 22-23) . Please examine the photos to see what a wonderful vessel im offering.As always sold to the highest bidder!.